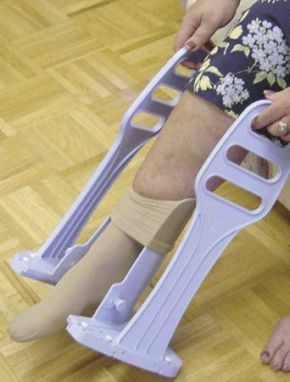 Heel Guide Compression Stocking Aid for larger feet. This compression stocking aid has a unique indented channel on the inside of the centre cone acts as a feel guide and keeps the foot in the perfect position while effortlessly pulling on the compression stocking. The extra wide cone is ideal for people with oedema or larger feet. High sturdy handles reduce the need for bending or stretching. The handles also feature 3 gripping levels to accommodate different heights and hand sizes. Easy to assemble and can be taken apart for travelling or storage. As a male with a tool box of much used tools, I thought I would put the device together very quickly - but found the little plastic screws very fiddly. The instructions said the screws should be squeezed together but I ended up using conventional screw drivers, and starting the screw action away from the device, separating them, and then putting them where they were needed. Once I used this technique, it became a 5-minute job. I need the device because I live alone and am about to have a hip replacement operation. However, I don\'t think the handles are high enough to maintain the body angles required after such an operation ( when putting the stockings on ). I have modified mine by attaching a loop of strong linen tape to each handle, which effectively gives me an extra 12 inches of handle length. With this modification, I can now (after a few false starts) quite easily pull the compression stocking right up to the knee. My only other comment is that I consider the device rather over-priced - but \'needs must\'! !